Did you know one of Ardmore PTSA's largest source of income is from Employee Matching-Gift programs from companies like Microsoft, eBay, Boeing, etc.? For every hour you volunteer at school or at recess or at the board meetings, most companies match the hours. Please check with your HR department if they have a process in place and if you volunteer or have volunteered, do not forget to match the hours. If you are a Microsoft employee, Microsoft will match your monetary contributions during the Fundraiser event and also donate money to Ardmore for the volunteer time that you spend at school. Microsoft matches each employee's donation, dollar-for-dollar, up to $15,000 per calendar year. Volunteer time is matched at $25 per hour. 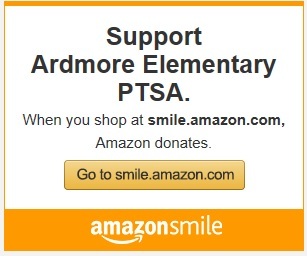 You can donate directly to Ardmore PTSA through Microsoft's online portal at aka.ms/give. You can also use this link to log your volunteer hours for Ardmore for employee matching. Ardmore PTSA's information is already listed with Microsoft, so you will be able to donate online easily. Visit aka.ms/give today! Parents, I’d like to update everyone on the conversations on bullying that we started at the end of last year. A set of actions have already been taken, and there’s a plan for community engagement throughout the year. Over the summer, 100% of Ardmore teachers and staff went through an equity training called Beyond Diversity. This training had already been planned for several months, and Ardmore is the only school in the entire Bellevue School District where everyone was provided with this training. I’m betting parents will start noticing changes in how teachers and staff approach some situations. There will be several changes to recess. There will be a better adult:student ratio, and there will be an increased focus on recess as a time for teaching behavior and conflict management skills. We completely redid the event we used to call "Taking care of business" to focus on welcoming parents and providing information on how the school works—everything from where to drop off kids in the morning to how the school addresses issues with student behavior. We hope everyone found the Welcome Tour and BBQ valuable, and we’ll continue these conversations throughout the year, with Curriculum Night being our next focus. We found an outside, highly qualified expert to help facilitate community conversations on discouraging bullying and embracing diversity. Read more in the next section. By no means do we think we’re done, and now that everyone is back from vacation, it’s time for a set of community discussions. During the summer, we started working with an outside consultant: Erin Jones. From The Seattle Times: Jones “has served in the state superintendent’s office as an assistant superintendent and has been a teacher and district administrator. She won the 2008 Washington State Milken Educator of the Year award and the state PTA Educator of the Year award in 2015.” (http://www.seattletimes.com/seattle-news/education/2016-election-results-washington-state-schools-superintendent/) Among these and other accomplishments, Erin is an expert facilitator for the community conversations we’d like to have. During the first part of the school year, we will hold a listening tour at venues throughout the community, facilitated by Erin or one of her delegates. These meetings are intended to be small-group sessions where we listen to your experience at Ardmore. We’ll use what we hear to build a list of issues to address. We’re aiming to complete this listening tour in 8 weeks. Then, we’ll use a committee of parents, teachers, administrators, and school district staff to talk through the issues and propose solutions. The committee will be built with equitable representation of members from throughout our community, and it’s just one place where the staff’s “Beyond Diversity” equity training will come in handy. Right now, our ask is that all parents engage in the listening tour. We’ll provide lots of ways for folks to sign up to host a stop on the listening tour. We’ll have more asks throughout the year, but the listening tour is what to focus on now. Please engage as a partner with the Ardmore staff and your fellow parents to help educate all students in our community about proper behavior and conflict management. Math, science, and reading instruction don’t stop when the bell rings at the end of the day, and neither does instruction about socio-emotional learning (SEL). Ardmore has a research-backed methodology for teaching SEL. Take time to learn about it throughout the year, and partner with the adults around you to help teach our students. Curriculum Night on September 14th from 6:00 – 7:30 p.m. is the next opportunity to hear about Ardmore’s approach to SEL and the methodology “Positive Behavior Interventions and Support” (PBIS). Our students will make mistakes on their math and spelling tests, and they’ll make mistakes when interacting with each other. Ardmore will not shy away from more traditional forms of what we’d call “punishment,” and when certain lines are crossed, that’s what’s called for—students must learn that society will not tolerate certain behaviors, and there are real consequences for those behaviors. But in most cases, Ardmore’s first motion will be to use behavioral mistakes as moments to teach, not moments to punish. And if our students can’t be taught behavior and conflict management as elementary school students, it won’t get easier later in life—for them or for us. If you have questions or input, please contact us at ardmoreptsa1@gmail.com. Otherwise, we look forward to seeing you at Curriculum Night and on the Listening Tour! How are all of these investments possible? Over a series of several years, members of the PTSA have built up a modest surplus of budget through tireless fundraising efforts, especially the annual Ardmore Olympics event. Paired with very careful spending, the board now finds itself with enough funds to make some incremental investments this year. Thank you to all of the amazing parents, teachers, and students who worked to take Ardmore’s PTSA funds from nearly $0 a few years ago to a surplus today! Your work makes it possible for Ardmore to invest in our kids and teachers in a way that's above and beyond. Did you know that Ardmore is one of the smallest elementary schools in the Bellevue School District? It’s true! But it’s sometimes hard to believe when you see everything going on in these hallways. So far in the 2016-17 school year, we’ve had huge attendance and great participation from students and parents alike at the Ardmore Olympics, Winter Musical, Walk to School Day, Family Fun Night, and more. Through the PTSA, we’ve also established Indian and Latino parents groups and funded multiple field trips, more books for the library, more supplies for the Art program, and school pictures to name a few. Our PTSA has also been recognized this year by the Bellevue PTSA Council for creative communications and outreach to our parent community. Ardmore may be small…but we’re mighty! Get ready to ride the Eagle momentum into a busy February, when the Ardmore staff and PTSA will host our next round of events and also provide more grants to support our teachers, library, and overall school needs. We want parents’ input on these decisions – so please join us! As we kick off 2017, we’d like to thank our incredible PTSA and Ardmore teachers and staff for a highly successful school year to date. Now, let’s keep flyin’ in February and beyond as we look forward to Science Fair, Talent Show, and more in the second half of the year. As Mr. Miller would say: See y’all around Ardmore! Hi, Ardmore parents! With the start of school, we wanted to let you know what your PTSA has been up to this summer. After sending a survey and gathering parent feedback, we formed our first set of committees, starting with Back to School, Olympics, and others that needed to start right away. You can find a list of current committees and leaders (as well as PTSA officers and contact information) on our website at http://www.ardmoreelementary.org/ptsaboard.htm. We held our first board meeting in August and elected our first set of board members. Our board members are the committee chairs plus our principal Mr. Miller and assistant principal Dr. Ewing. We intend to add more people to the board throughout the year, as we form more committees. Also, we’ve put together a public OneNote notebook so that anyone can always see what we’re up to. You’ll find agendas and minutes for board meetings, list of committees and chairs, upcoming proposals, etc. Board meetings are the first Tuesday of every month at 6 pm at Ardmore. Our first General meeting is on October 11, where we’ll form our next set of committees based on parents’ ideas, input, and availability to help.